This 20 Minute Mozzarella Chicken is the perfect recipe to make when you’re short on time. It’s a low carb version of chicken parm, but I promise you won’t miss the breaded version in this super easy and delicious recipe. Served with pasta it is a quick and filling recipe. This post was first published on January 6th 2017. This is an updated version. 1.) It’s super fast and super easy (totally my kind of recipe). 2.) It’s flavorful with lots of pasta sauce. 3.) And it’s super cheesy with all the mozzarella cheese! Yes yes yes! 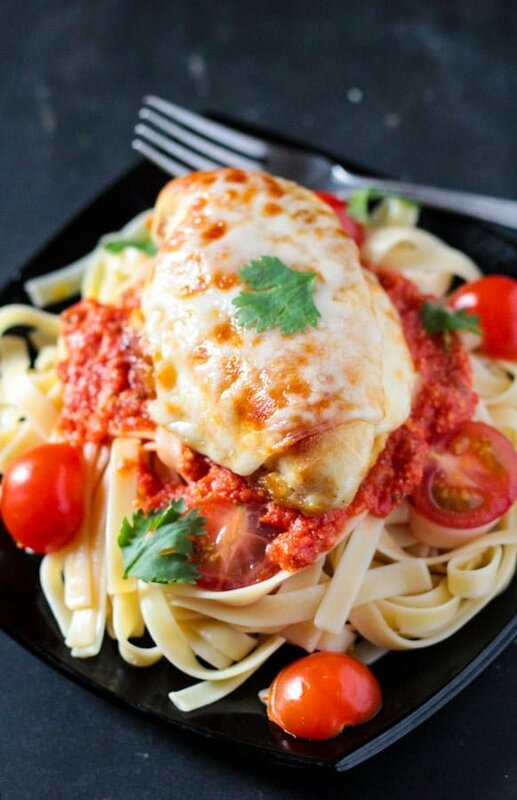 While this easy mozzarella chicken is super fast and takes minimal effort, it’s perfect for winters because it’s a warm cozy dish with lots of pasta sauce and cheesy baked chicken. Comfort food at its best without a lot of complicated steps and time is the best kind, no? 1.) So this 20 Minute Mozzarella Chicken was born out of a hankering for parmesan chicken, but I didn’t want to go through the whole process of breading the chicken breasts. So instead of breading the chicken in breadcrumbs I just seasoned the chicken breasts with a couple of spices and lemon juice and seared it in the frying pan. 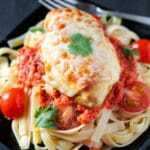 While it’s not quite the same as parmgiana chicken, this 20 minute mozzarella chicken is perfect if you are short on time. 2.) Then I simply spread the pasta sauce in a baking dish, and nestled the cooked chicken breasts on top of the sauce. Then I added slices of mozzarella cheese and baked it until it’s all golden brown, ooey gooey and simple delicious! 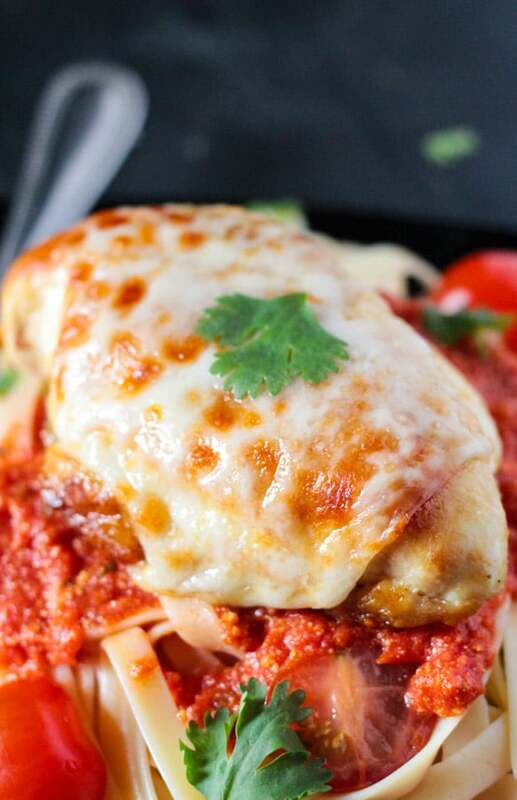 I used sliced mozzarella cheese, but even shredded mozzarella cheese would be great in this 20 minute mozzarella chicken recipe. However, try to get fresh mozzarella cheese as that’s the one that tastes and melts the best. 3.) Serve the mozzarella chicken on a bed of cooked linguine (or any kind of pasta you like), and you’re all set for a delicious dinner that tastes like a million bucks! I loved this dish for its simplicity and bright flavors and minimal ingredients required. It’s the perfect kind of weeknight dinner or for when you want a really good comfort dish but don’t want to spend too much time in the kitchen. I mean 20 minutes for such a restaurant style dish? I do hope you try this brilliantly simple and delicious 20 Minute Mozzarella Chicken because it is da bomb! 😉 Lol. 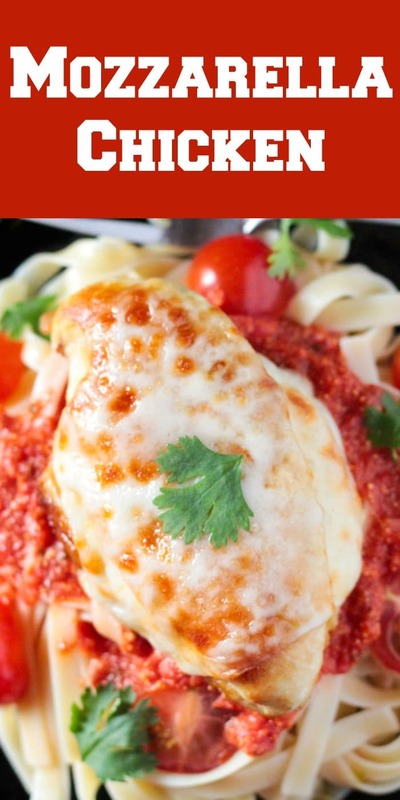 This 20 Minute Chicken Mozzarella is a quick and delicious recipe which is a perfect alternative to when you are craving Parmgiana Chicken but are short on time! Season the chicken breasts with salt, pepper, garlic powder and lemon juice. Set aside. In a large frying pan, heat the oil and then add the chicken breasts. Cook on both sides until browned and cooked through. This will take about 3-4 minutes on each side but it also depends on the thickness of the chicken breasts. In a baking dish, spread the pasta sauce so that it covers the base of the dish and then place the cooked chicken breasts on top. Top the chicken breasts with the mozzarella cheese slices. Place the baking dish into the oven for about 5-7 minutes or until the cheese is golden brown. You may turn on the broiler to get a deeper golden brown color on the cheese. Serve over the cooked fettuccine pasta. YUM!!! This recipe looks very tasty! I like the fact that this recipe can be cook quickly and easily. Very interesting combination of ingredients. This is a great dinner for me. I want to try it immediately. Thank you for sharing this great recipe! Mozzarella chicken in 20 minutes? My family will love me for making this – they love anything with chicken, marinara sauce and cheese. Oh my goodness, this chicken looks so tasty and the perfect comport food! now this is certainly a drool worthy photo and yummy meal that we all would love! Very nice to see you back in action. You do think of some wonderful dishes. Sounds great and seems health as only 600 calories and so lots of protein. Now we know protein is good it helps burns calories. So healthy & mouth watering . Great thinking. The pasta is fettuccine? Pasta is great. I wonder how olives will go with this? Sounds like such a comfort food. I’m bookmarking this one for a weeknight dinner — it’s exactly the type of meal my kiddos love. Yep! I would be all over this! I live healthy versions of popular recipes. This one ticks all my boxes. This looks and sounds absolutely amazing, this would definitely be a popular dish in my household! I love that it takes no time at all to make too! you really had me just with that photo of the cheese and chicken just looking at this I cant wait to eat some! I must make this soon! Mozzarella chicken is always a winner in my list and my family loves it too. I need to make it soon because it is so tasty and your version looks easy to make. What a great looking dinner for any night of the week. Chicken and pasta together is a match made in heaven. Love all the cheese….and how easy this recipe comes together. So beautiful…and perfect for summer! What a gorgeous and mouthwatering meal! This looks wonderful and your pictures are beautiful! Pinning for later. Mozzarella chicken sounds delicious, This is complete meal. I would like to give it a try as my kids love cheese and chicken. Oh this looks absolutely perfect. We love easy chicken dinner like this one in our family. My kiddo is such a fan of melted mozzarella. Well who isn’t right?! Love the addition of lemon juice and garlic. Yum!